It seems I am a “shape-changer”. I have lugged three huge lawn bags filled to the brim, out to the trunk of the car: some things just don’t fit they way they used to. Whether this is good news or bad, I will leave up to the imagination. However, I found myself thinking of this the other day in relation to DA and wondered how things “fit” for him since his return to the states, his career, and his family. Like coming home to a “found” trunk of clothes, some fit, some don’t, and some old favorites look different. Each missionary coming home (or anyone returning from a two-year-life-changing-experience) finds that things “fit” differently than before. We are not the same shape as we once were. Neither within nor without. Each person takes their own amount of time to reassess, evaluate, and experiment on the “shape” they are in. Which things are the same? Which are different? And most of all – What did I bring home with me that I especially want to keep? DA brought back an even greater determination to be of service to his fellow-man. This is very evident in the choices he has made of when and to whom, he has performed. I do not believe that this means he devalues his “regular” fan base. I think it just means he has sharpened his focus. We know that he has said how he loved being in the mission-field because the focus was not on himself. I can imagine that trying to keep the focus on what he is doing rather than on himself, is one reason he seems more distant to his fans. It is because of his own goals and what he needs to do in order to achieve them, not from anything the fans have done. We are a diverse and sometimes unwieldy bunch, and we love to focus on him. He on the other-hand, would rather not focus on himself, and he has only so much time and energy. I believe that his ability to balance the demands of a public life and a private one will improve with time and maturity. (When your public is your “buyer”, you simply have to connect!) Yet for now, he wants to be more private. I can respect that. He is working. Goes to school. Writes music. Records. Travels. Spends time with family. 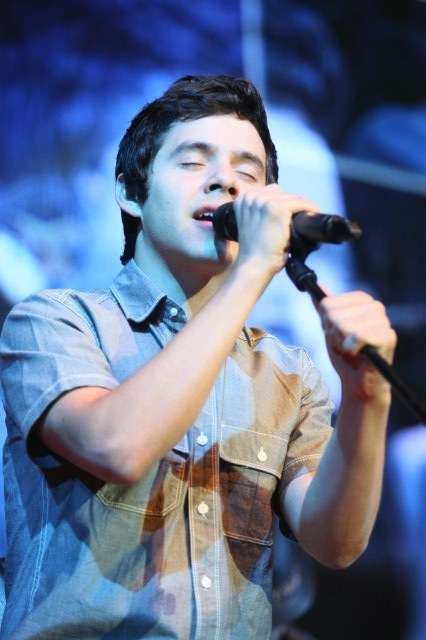 Has told us in different ways that he is working with a variety of music. 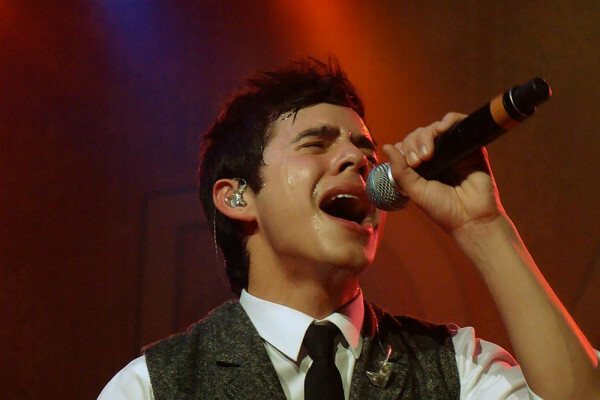 And… Although he has not sung to us (sigh), I do not believe that that means he does not want to. It is just that for the first time in his life, he gets to try it his way, in his own time frame, without constant input from outside sources. What a challenge he has taken on! What courage it must take to push himself to stand musically in a place previously denied him, and to hear the echo of his own heart. He will come. What he brings to us all then, will not be perfect. But it will be as perfect as he can make it. And it will come from as true a place as he can discover: it will be with as much of his soul as he can form into sound. It will be the shape of things to come. Listen to David give the details and see the instructions below on how to submit your video of “Glorious”! I can’t wait to see the finished product! 1. Download the instrumental MP3 and lyrics (http://bit.ly/1yqNiu6) or sing along with the instrumental track at https://www.youtube.com/watch?v=Ml6Up…. ex. 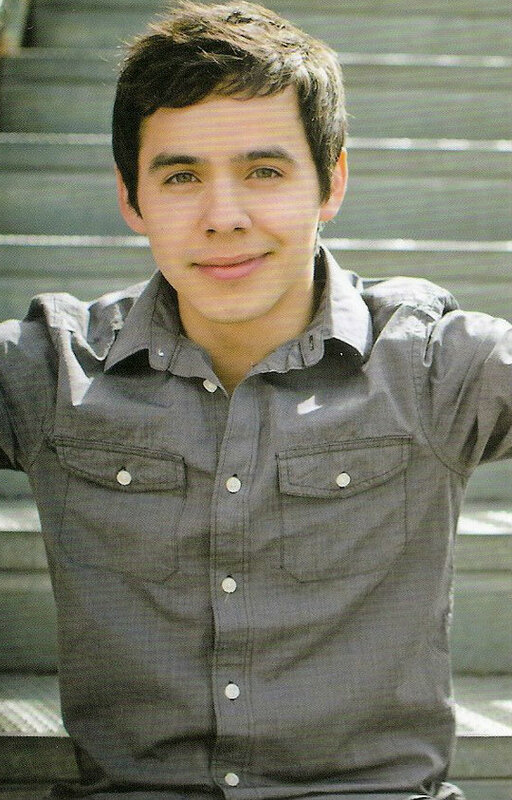 “Glorious” by David Archuleta from Meet the Mormons Cover By Susan S.
5. 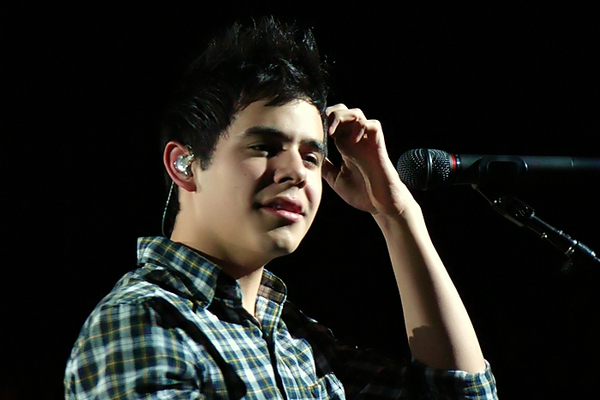 In your video description, include your location (city, state and country), and your message for David. All entries must be uploaded by Monday, November 3, 2014. Winners will be announced Friday, November 7, 2014. 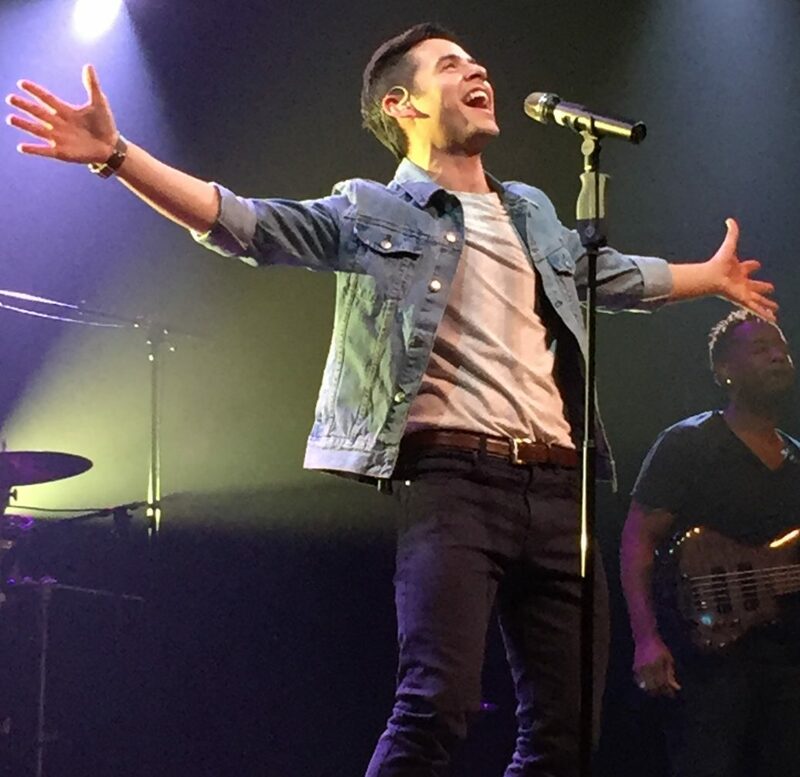 Be sure and tune in this Sunday for a sneak preview of a new recording byDavid Archuleta–it’ll heard near the end of the soon-to-be-released movie “Meet the Mormons,” but you can hear it sooner than that! 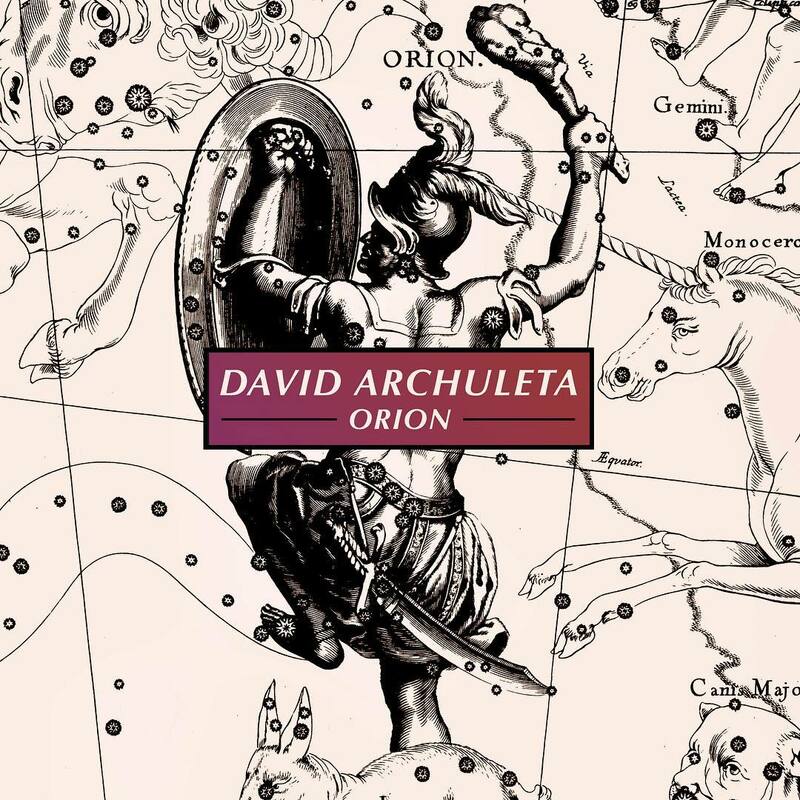 You can hear an interview with David plus the new recording on FM100.3 or online at http://www.softsundaysounds.com/ this Sunday at the end of the first music set in the 7am, 9am, 12pm, 2pm, and 4pm hours. This comment has stuck in my brain ever since I had heard it. Back then I really didn’t know what to think. Did it mean that he would be so different that I wouldn’t understand who he had become? 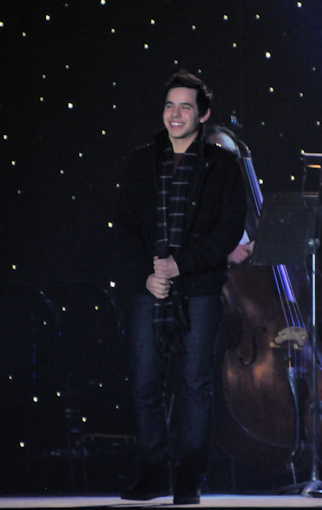 There was never a doubt in my mind that David would not continue his singing career. I had a few concerns about his readjustment to living back in the US. After a few weeks, I was excited to see that he was back writing music and hanging out with musicians in the studio. They were happy to be working with him on new material. He was beginning to act like the “old David” that I knew from 2012. And then he got silent. Not too much coming from him on twitter. No vlog besides the short ones just when he came back home. Fans began to get restless and the rumor mill buzzed with everything from he’s going to college to he is dating like crazy, as he looks for his kind of perfect. Many “sightings” began to pop up on twitter, some with pictures, showing him with friends around Utah. Something that never has happened before was that people tweeted pictures from Sunday services, some posed with a fan after services, some without his knowledge. 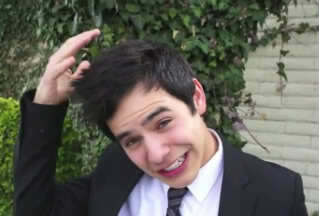 Fans were desperate for news and ravenously consumed any information that may give a clue to what David was working on. Then we got word that Called To Serve would be live-streamed. Finally, we got to see what David was doing on his mission, first hand. Because he had asked for privacy while he was in Chile, it was a relief to see him talk about his mission publicly. I think it was a relief to him too. David posted a vlog to fans where he talked about what he was doing. Exasperated by things he had read online about his lack of communication with fans, he said he had been busy working on writing music. I saw an assertive man telling us how he wasn’t going to do things just to please others. He was going to run his career his way. If he had anything to share, he’d be in touch. This was a huge change in how he communicated before he left for Chile. This time there was no doubt. 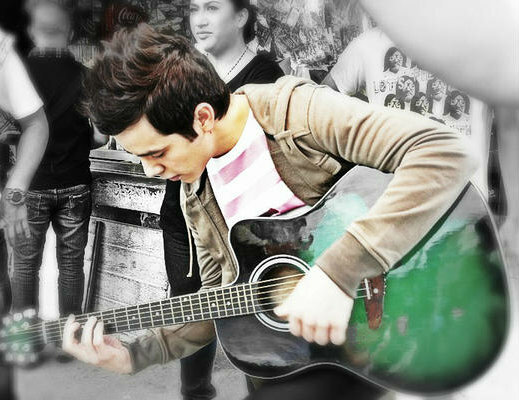 He was not going to be pressured to produce music or anything else, until he was satisfied with the result. Eventually, more news surfaced showing that David had visited Shay Carl the YouTube celebrity. I’d never heard of him but I did read where he might be of help showing David how to become more social media savvy. It might have paid off some, because we had the Face To Face chats which were live-streamed for all to view on demand. Though LDS youth were the target, I know fans enjoyed watching him speak, even in two languages. 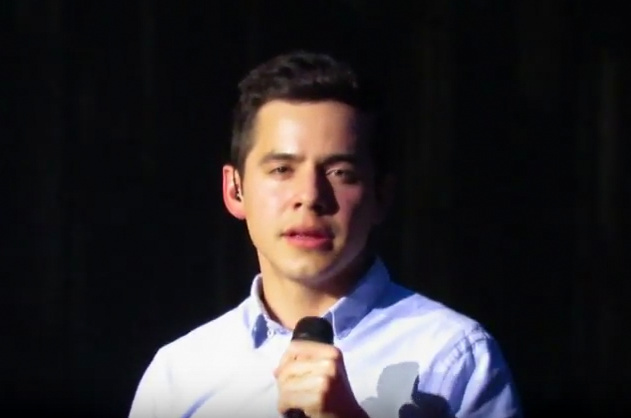 These videos show David’s genuine love for his faith and fellow man. He was as real and open as I have ever seen him. I am beginning to get what “The David who left will not be back” meant. 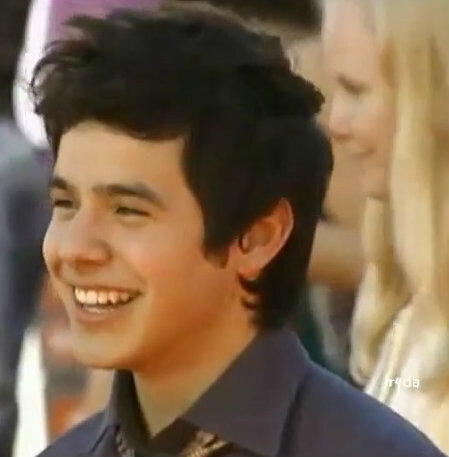 David has become more open about who he is, a mature man who knows what he wants in his life. 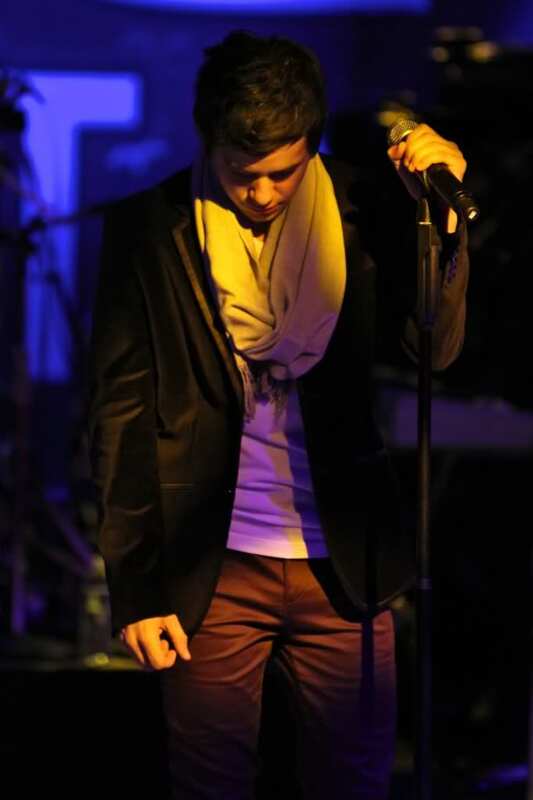 Not just a singer, but a humanitarian, who sings. 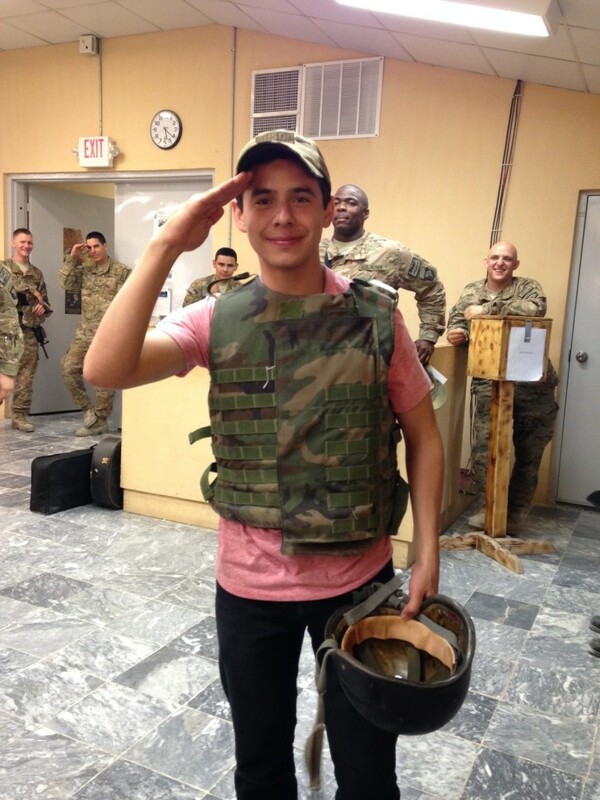 The Military Tribute Tour was a chance for him and the other men who entertained with him, to thank the troops by using his God-given talent. 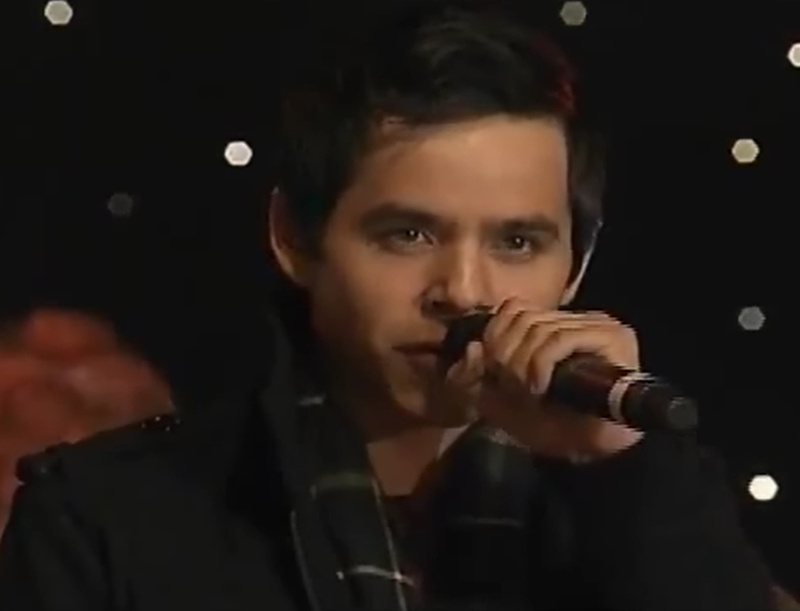 He even said he had to embrace the title “David Archuleta” as he sang for them. 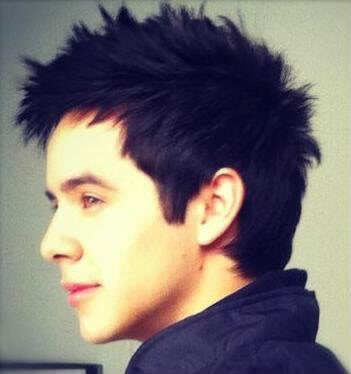 So, I have come to the realization that in some way, David had to go on his mission to find himself. To be comfortable with expressing what he needs in his life. He left as a young man who needed to get away from all the celebrity and what that meant in his life. He came back a mature man who knows what he wants and is willing to embrace the celebrity on his own terms. Mission accomplished! Photo 1: I don’t think that’s how you properly salute, but oh well haha. We have to wear the body armor sometimes when we travel from one base to another on military aircraft here in Afghanistan. First off, I am sorry that I can never write less than an essay and that my emails are always so long! But please bear with me and my imperfections with this one. I wanted to write to all of you seeing as this last week has been quite incredible for me. Right now I am writing this to you as blasting winds full of dust attack my face and my eyes (I’m outside to have some time to myself). I am currently in Afghanistan, and as I don’t know when I will ever be here again I would like to take the time to write to you under interesting circumstances. What am I doing here? I was invited by a man named Dan Clark. He is a world renown speaker who is the main contributor to the Chicken Soup for the Soul book series. He has spoken many, many times to the troops all over the world. We are joined by a professional impersonator/comedian named Jason Hewlett (he’s hilarious), and my voice trainer Dean Kaelin (accompanying me on the piano and guitar, and performing himself a number) to do a military tour. 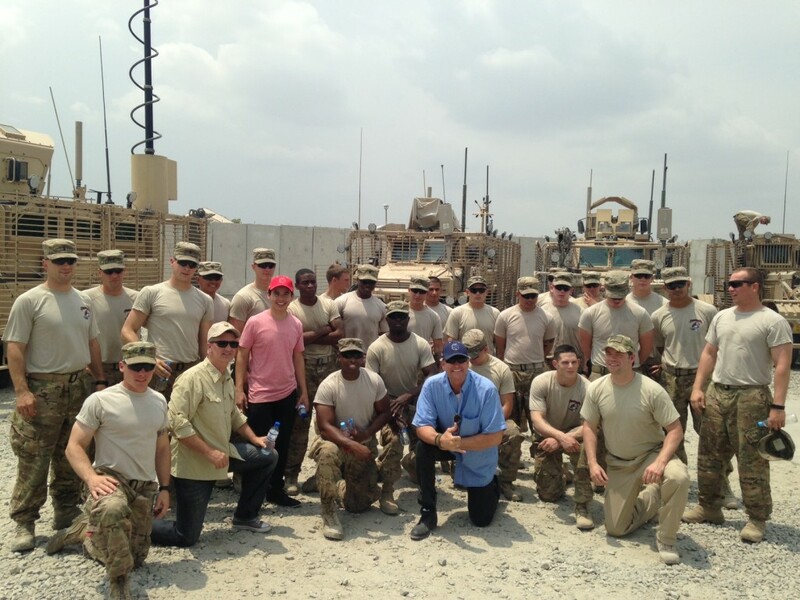 It is a tour with the focus to inspire and give an uplifting message to the troops as we entertain. July 8th we left for the Middle East. We began in the country of Bahrain– a country I had never even heard of before. Afterwards we went to Kuwait. It was amazing to see how empty it is here terrain-wise: sand, sun, dust, and desert. However, due to oil and gas these are very wealthy countries. We visited an Islamic mosque and I was amazed to see that they believe in prophets, and even believe in Jesus Christ… As a prophet of God; not as the Only Begotten, yet they believe that He will come again. It is Ramadan here which is the month of fasting, where they cannot eat or drink from sunrise until sunset. We cannot eat or drink in front of them, and have to keep long-sleeve shirts and pants when in public Muslim-eye to not offend their traditions. Anyway, this is a military tour, not a desert tourist trip. I wanted to express my love for these military men and women. 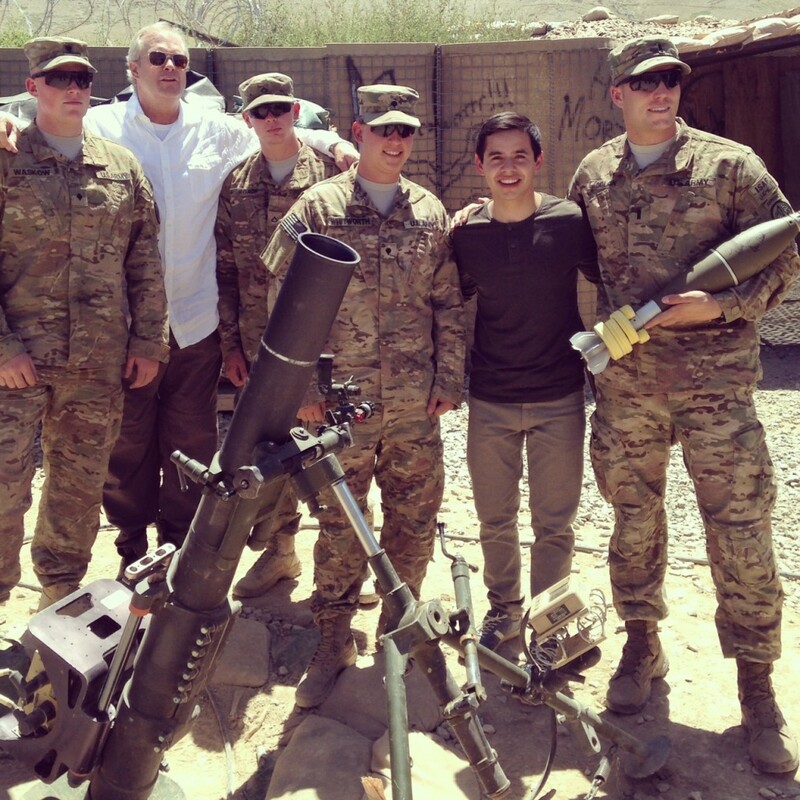 Here in Afghanistan– along with in Iraq–they are in combat and there are attacks going on. I was surprised at the friendships and the respect the local people have with and for the troops, as the reason why we have been in these countries is to protect these people from opposing groups who seek for power and are extremists and terrorists trying to overtake the countries. We are now making transitions to let the Afghan military take charge of defending their own country so that they may strengthen their own sense of duty and value those rights and liberties more by taking the lead themselves. These are people who learn what the word “duty” means. They literally put their lives on the line with rockets being shot at the bases, mines exploding their and civilians’ paths, and suicide bombers coming at them. It is real, but they do it because of their duty to our families and to our country, and to their duty to protecting countries and people who cannot do it alone. How grateful I am for their dedication and for them being awakened to their duty. I hope the next time you see one of these service men and women, you think of their commitment that they have to this duty: to protecting our amazing and beautiful country where we have freedom, and working to help others have freedom as well. We take what we have for granted– whether- we go to the air-conditioned malls, or sit at our peaceful homes bored. Let us think twice about our liberty that we have in this promised land, and how God has truly blessed us. During this trip we are also getting to do some special faith-based events that we call firesides. It has been a wonderful bonus to the trip. We have one more week of shows, and I will try and give you another (shorter) update as we come to a close. P.S. I’ve attached some photos. Photo 2: This is a mortar with some army men that is setup to shoot back quickly at locations where incoming attacks come from. Photo 3: These army men use those giant explosion-protected vehicles in the back to search for mines. They basically go through explosions many times so that it doesn’t happen to other military troops and civilians in normal cars or walking. This event will be livestreamed twice, first in Spanish at 5:30pm then in English at 7:00pm Utah time. The links are highlighted in blue. TO JOIN THE LIVE CHAT, GO TO THE LDS YOUTH FACEBOOK PAGE ON TUESDAY JUNE 24, AT 7:00 P.M. MDT (9:00 EDT, 8:00 CDT, 6:00 PDT). You can also view the event live on the Mormon Channel on YouTube. After June 24, a video of the event will be available on this page for you to watch at any time. 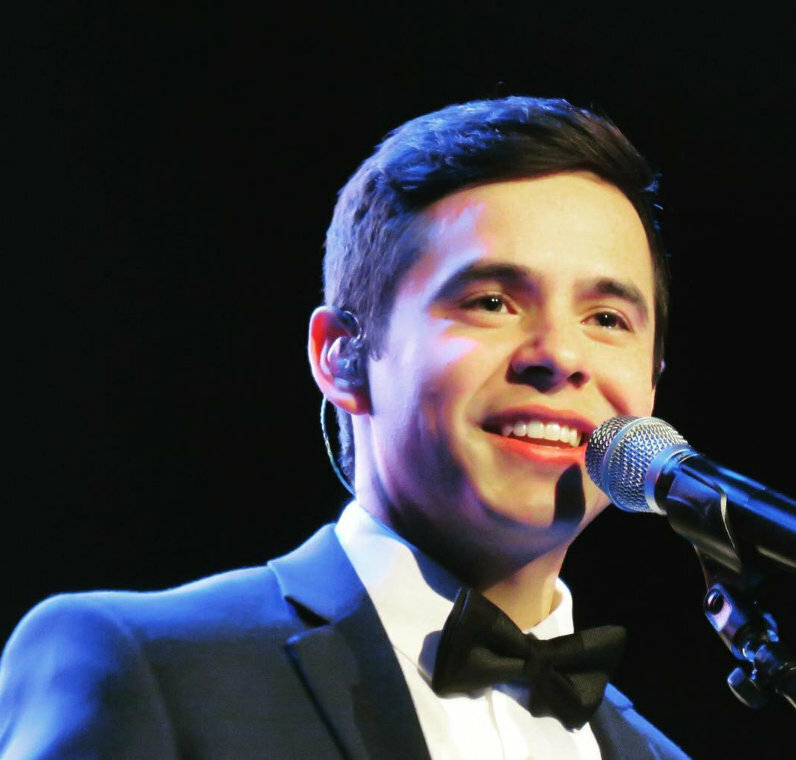 Participate in a live, interactive discussion with former American Idol contestant and returned missionary David Archuleta, moderated by Young Women general president Bonnie L. Oscarson and Young Men general president David L. Beck. 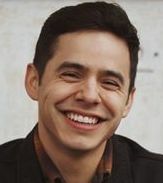 Youth around the world will have opportunities to ask questions in real time and hear about David Archuleta’s decision to postpone a successful music career to serve the Lord. He will also share stories from his mission, give advice for future missionaries, and share his testimony in word and song. Invite your friends! 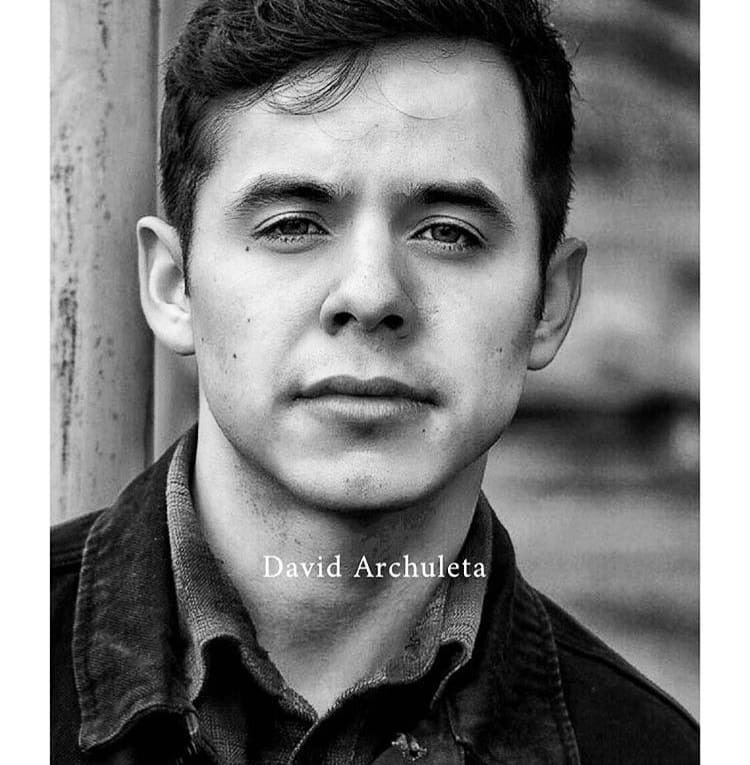 The LDS hosted David Archuleta live chat is geared for youth but from all I’ve read and the countless tweets worldwide promoting this event state that all are welcome. The questions that have been posted in English and Spanish so far cover a wide range of topics. 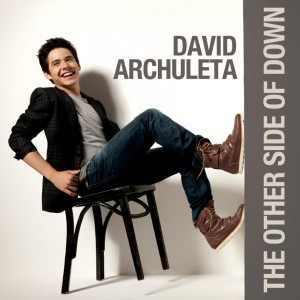 David will be singing accompanied by Kendra Lowe. PARTICIPA EN EL CHAT EN VIVO: VISITA LA PÁGINA LDS YOUTH EN FACEBOOK EL MARTES 24 DE JUNIO A LAS 5:30 P.M. (HORA DE SALT LAKE CITY). También podrás ver este evento en vivo en la página del Canal mormón en YouTube. Después del 24 de junio, colocaremos el video en esta página para que lo vuelvas a ver en cualquier momento. 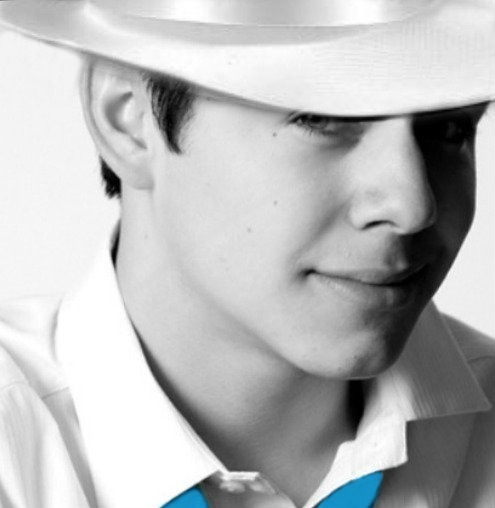 Participa en una conversación interactiva, en vivo, con el ex participante del concurso televisivo American Idol y ex misionero David Archuleta. Será moderada por la hermana Denise Posse Lindberg y el Presidente General de los Hombres Jóvenes, David L. Beck. 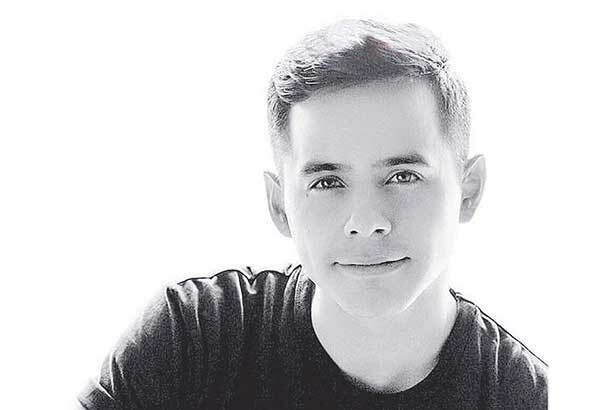 Los jóvenes de todo el mundo tendrán la oportunidad de hacer preguntas en tiempo real y escuchar a David Archuleta sobre su decisión de posponer una exitosa carrera musical para servir al Señor. También compartirá su testimonio, experiencias misionales y brindará consejos a futuros misioneros, no solo por medio de las palabras sino a través de la música. ¡Invita a tus amigos! 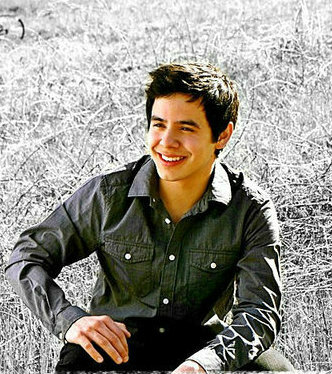 El LDS evento en vivo con David Archuleta es guiado para jovenes pero todo que lei promoviendo el evento indica que todos son envitados. Las preguntas en ingles y espanol cubren muchos temas. David cantara acompanado por Kendra Lowe. Oh No Purple! Twitter Party! While I was gone my friend and my brother-in-law took all of my clothes. Just a few things left like these. So as my friend and my brother-in-law took just about all of my clothes while I was gone (I let them) I have run out of stuff to wear. Luckily there was a suitcase of things from the Philippines like these Bench shoes. Thanks @Kariontour for keeping the suitcase safe! And thanks #Bench! I guess I’ll have to stop being stubborn and buy more clothes eventually though. @Springchic96 love that place! Guess what I was eating for lunch??! Macadamia butter. Yep. 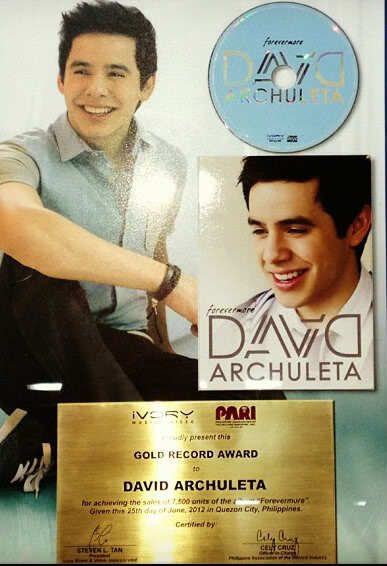 @DavidArchie oops! typo!!! meant to say..what have YOU been up to today? @Marylee_NCGirl had a writing session via Skype which was pretty cool! My first time doing it.